(Phys.org)—James Quach, a research fellow at Tokyo University is suggesting that it might be possible to observe a gravitational Casimir attraction by carrying out an experiment he has envisioned. In his paper published in the journal Physical Review Letters, he suggests that it might be possible to detect such an attraction using two mirrors that are able to reflect gravitational waves. Despite thousands of years of thought and study, scientists still cannot explain gravity—one current theory suggests its force comes about due to gravitational particles called gravitons, but no one has been able to prove they exist. In his paper, Quach suggests an experiment using superconducting materials may be the key. Prior research has shown that if two sheets of metal are placed near one another in a vacuum, they will attract each other. This is known as the Casimir attraction, and it comes about because the sheets reflect electromagnetic waves—the same sorts of waves remain unrestricted outside of the space between the sheets and exert a slight force—thus the sheets are not drawn to each other, they are actually pushed. Some theorists have speculated that Casimer attraction may work with gravity as well, and if a way could be devised to show it does, that would go a long way towards proving that gravitons are real. But of course, no one has yet found any sort of mirror that might be used to reflect gravity. Quach suggests that a mirror made from a superconducting material might do the trick, if it is first cooled down to near absolute zero. He has done the math and found that such a setup might actually work. He believes that if such an experiment were carried out, it would prove the existence of gravitons. Not mentioned are the ramifications should the experiment succeed. An ability to reflect gravity "waves" it would seem, would allow scientists to create shields or coatings that when applied to objects would make them weightless, because the gravity pulling them down would be reflected away. That, of course, would completely change such things as transportation, industrial processing and of course air and space travel. 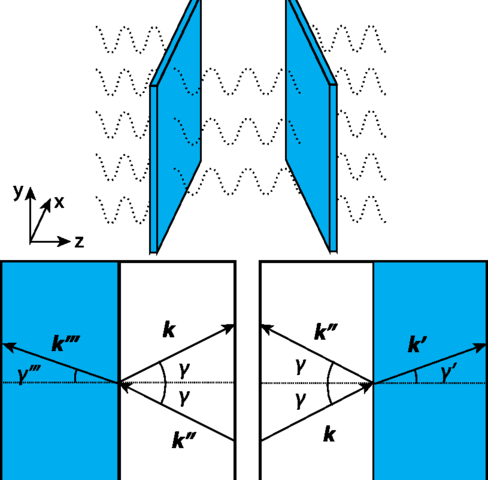 We derive the gravitonic Casimir effect with nonidealized boundary conditions. This allows the quantification of the gravitonic contribution to the Casimir effect from real bodies. We quantify the meagerness of the gravitonic Casimir effect in ordinary matter. We also quantify the enhanced effect produced by the speculated Heisenberg-Couloumb (HC) effect in superconductors, thereby providing a test for the validity of the HC theory, and, consequently, the existence of gravitons. Yep. Podkletnov's paper is cited. Let's take this with a grain of salt. An ability to reflect gravity "waves" it would seem, would allow scientists to create shields or coatings that when applied to objects would make them weightless, because the gravity pulling them down would be reflected away. That, of course, would completely change such things as transportation, industrial processing and of course air and space travel. Didn't H. G. Wells think of this to back in 1901 with the publication of his novel "The First Men in the Moon" and called it 'cavorite' albeit only in a science fiction context, maybe a visionary after all, pity he didn't patent it, ha. Tell me if I'm wrong but I though gravity was classified as a fictitious force and thus one would think in couldn't be quantized into gravitons, good luck with the experiment anyway but the thought of a future arms race with such a cavorite gravity shield-like material literally scares me to death. At least this experiment shouldn't cost billions of dollars, and I therefore support it even if there is no chance of success (according to my theory). The Casimir force, like the "force" of gravity in the Cavendish experiments, is actually the force needed to keep two expanding objects apart (i.e. accelerate them away from each other). I've always thought that Einstein was right, it's bent space. Therefore no graviton? But still the problem of determining what it is exactly that's getting bent. Had a dream about separating reality - just like separating light with a prism. Have you ever seen so many "might". "could" and "possibly" in a single article on something other than climate change? Of course on climate change these statements are assumed to mean "absolutely". Well at least it's falsifiable. "the sheets are not drawn to each other, they are actually pushed"
Oh, almost forgot. Please note that this is a crackpot theory...from a crackpot (i.e. me). The surface ripples at the water surface do really cause the analogy of Casimir effect between two objects. But the gravitational waves do correspond the underwater sound waves in the water surface model and they do manifest itself as a Brownian noise at the water surface. Their shielding is the origin of gravity itself. There is no apparent reason, why the superconductors should interact differently with gravitational waves, once they're really gravitational. Yes, but the Podkletnov/Poher experiments were made with different waves, so-called the scalar waves of Nicola Tesla, which are analogy of turbulence at the water surface and which serve as a main component of dark matter in this model. These "waves" interact strongly with Dirac fermions within superconductors, but they're not equivalent to gravitatational waves. Their existence can be demonstrated easily with their mechanical effects as so-called fifth force. The fifth force in stationary environment is quite strong - but chaotic by its nature. For example it did ruin the results of Gravity-B probe, which also utilized the superconductive layers at proximity. Wait... so... we just have to invent something that reflects gravitational waves to detect gravitational waves? Makes perfect sense I guess, in a chicken and egg kind of way..
Take for instance the MOON. It does not turn. Not even a fraction of a millionth of a centimeter over millions of years. yet, mankinds basic and even most complex equations defining gravity can not explain this , can they? The moon turns around every 28 days, precisely as long as it takes to rotate around the earth. It's called a Tidal lock. http://en.wikiped..._locking might help clear up some of your confusion regarding the subject. kamcoautomotive, LagomorphZero is correct. Actually, what makes Earth so special is not the presence of life but that anything on the planet will not see the Moon rotate at all. An observer anywhere else in the universe WILL see it rotate. Perhaps you can make up a religion about that. Actually the Moon does rotate relative to the Earth, it's just that the motion is very small. It ended up that way because there's a damping force that stops the rotation. Here's an explanatory video. So it is all about reflecting bent space -sounds simple. The philosophy of physics, in its current implementation, is focused solely on studying abstract concepts in "extention" meaning we postulate existence of abstract objects as particles or waves or others and experimentally try to investigate phenomena they allegedly cause or are correlated with using general methods of mathematical field theory . No questions are ever asked about what wave or particle is in itself, which would be studying physics in "intesion" meaning what it actually is we study, thing in itself. Therefore we have advanced gravity or electromagnetism physics while having no idea what gravity or electromagnetism really is. Neither Einstein nor Newton had any idea about what gravity really is. They just studied what it does. They both admitted that their theories while tested gave them no insight into reality of universe. Well, first gravitons are only speculated and are not necessary in light of GR. Yes, people want it to exist, but wanting and being are often two very different things. Finally, they are really going to have to provide indisputable distinction between the famously weak Casimir effect from virtual particles vs the horrendously week effect gravitons might provide. Good luck. This is a measure of a wave that changes the shape of space and time of an unknown frequency and only upon the causal effects of the mass. Why? i.e. mass that changes the shape of the space and time it exist within. Sort of makes sense, but I think your tensor is flawed. Exactly how to separate from all the electrodynamics effects within the space and time of measure of reality., i.e. relative velocity without limitations. So if there is a relation of space and time and particle location as a 4D vector field. Nothing from nothing, all dynamics in between with a given description. Asking what waves and particles are is not the study of physics. Those would be subject dependent extrapolations. Observing the particles and waves as objects is subject independent (to a degree of certainty anyways, some theories tie in the objects actions to the observer). To explain it in a simple way it is like the study of a human being. Physics in this scenario would be the study of the humans actions in order to identify what kind of a person the human is. What you're proposing would be defining the human on what he's like on the inside. This would be philosophical in nature. If 3 philosophers were studying the human in your scenario (subjective) that human could be defined in 3 different ways. In the physical sense (objective) the human being evaluated by 3 physicists can only be defined in a single way, his actions appear the same to all 3 examiners. There's two slightly different intepretations of how the effect is manifested - one says that the gap between the plates precludes virtual photons of that wavelength, resulting in a relative excess of them around the outside faces of the plates, thus pushing them inwards towards each other. Since the gap restricts the size of a full wave that could be reflected between the plates, this too seems a fair appraisal of the effect. The other view is that virtual photons spontaneously appearing then disappearing again induce tiny currents in the plates, and that the attractive force is thus the result of the mutual EM forces associated with these fleeting currents. Ultimately however the root cause in both cases is Heisenberg's uncertainty principle, regardless of the precise modus oparandi.. The above method of gravitational waves detection is one of the worst possible. The gravitational waves are believed to be in acoustic spectrum (bellow frequency of radiowaves) and they're believed to propagate with speed of light, therefore their wavelength will be very long (in the range of few dozen meters or larger). The superconductive plates therefore must be very large and they do rely on very strong background field, which hasn't been detected yet with LIGO and another detectors. "An ability to reflect gravity "waves" it would seem, would allow scientists to create shields or coatings that when applied to objects would make them weightless, because the gravity pulling them down would be reflected away." Seriously? This whole site is devoted to science and the writer doesn't know the difference between gravity and gravitational waves. No, a material that reflects gravity waves will not render an object weightless, much in the same way that an optical mirror which reflects electromagnetic waves(light) won't make a magnet stop working. Podkletnov reportedly observed the antigravity effects above the rotating superconductor disk - actually the rising of cigarette smoke was the accidental observation in which whole this research started. This doesn't imply that this effect does exist above stationary disk or some shielding/coating. Wish James Quach every success with his proposed experiment and await the results with eager anticipation. We already know, that the reflection of gravitational waves from superconductors works - Claude Poher did tested it with spectacular effects and high reproducibility. It's just not gravitational waves, but a scalar waves, what gets bounced during it. Now the physicists just want to reproduce the effects, which they ignored for decades - just under another name.